Located in Coral Bay, just 300m from a lovely beach in Paphos, Crown Resorts Horizon is a family-friendly luxury hotel offering comfortable accommodations with much needed relaxation and privacy. Almost equidistant from the archaeological site of Tombs of the Kings and the bustling Paphos Town, this property is a luxury retreat nestled amidst lush gardens and amazing natural scenery. 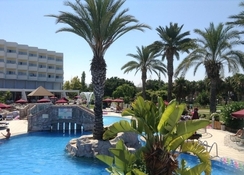 Offering a seasonal, outdoor pool, an indoor and a children’s pool, well-appointed guestrooms with lovely Med views and on-site restaurant famous for their delicious varied cuisine, this hotel invites guests to feel at home during their fun-filled holiday to Paphos. 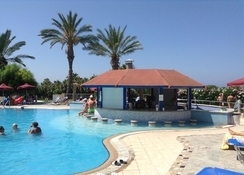 Crown Resorts Horizon is located in Coral Bay, just 300m from the Paphos beach. The property is 10km Tombs of the Kings and 12.5km from Paphos Town. The Paphos Zoo is at 7.2km, while the Adonis Baths Waterfalls is at 7.5km. The nearest airport is Paphos International Airport at 27.2km. The well-appointed guestrooms at Crown Resorts Horizon come with furnished balconies. All the units feature air-conditioning in the summer and heating in the winter. Amenities in the rooms include flat-screen, satellite TV, free toiletries, hairdryer, private bathroom etc. For an extra charge, a safety deposit box, a mini-fridge and Wi-Fi are available in the rooms. Some units come with views of the Mediterranean Sea. Crown Resorts Horizon has an on-site restaurant with a terrace by the pool that serves breakfast, as well as lunch and dinner. Relish delicious and varied cuisine prepared by expert chefs from the freshest of ingredients while enjoying panoramic views. Guests may relax with cocktails and drinks served at the bar in a delightful ambience, or at the swim-up pool bar. The hotel has an outdoor pool (seasonal) and another indoor pool where guests could relax and avail massage services (additional charge) or take a refreshing sauna (additional charge). There is a spa and wellness centre (additional charge) that provides massages and therapies to recharge your body and mind. Those wish to stay active can do so at the fitness centre (additional charge). Guests can play tennis, table tennis or billiards at a charge and bicycles are available for hire. The hotel also has a games room and free Wi-Fi in public areas. Restaurant food of very good quality and always plenty of tables available inside and out. 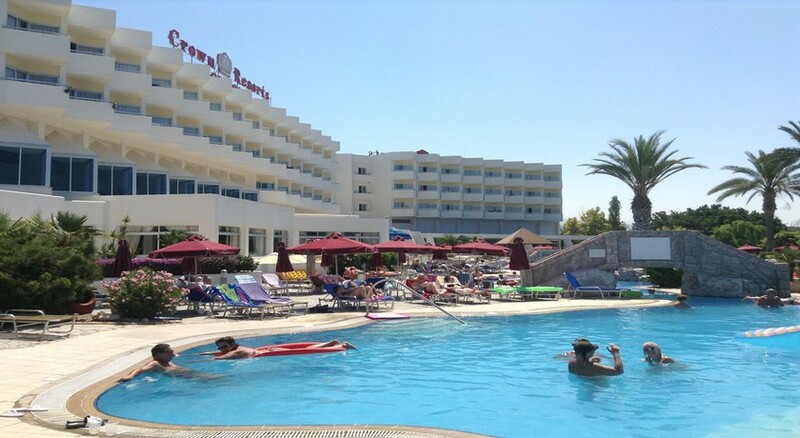 We had a lovely holiday,staff was helpful the hotel was nice and clean,food was good. Couldn’t fault this hotel the rooms spacious and comfortable linen and towels changed daily and helpful waiters and reception staff. Above all the food was outstanding a very good selection and plentiful. Would definitely go back. Hope to return soon . Had a lovely stay. Hotel excellent. Food excellent. Staff excellent. Only one issue, the charge of transfer from airport to hotel..
Good location for beach and great pool and spa. Good choice of food. Room not so good as noisey and the hair dryer broke. My friend and I booked this hotel as a cheap get away for some fun in the sun. The rooms were clean and the food was plentiful. We went to spend time out and about so as long as the room was clean that was fine by us. For the price we paid I think it was worth it.